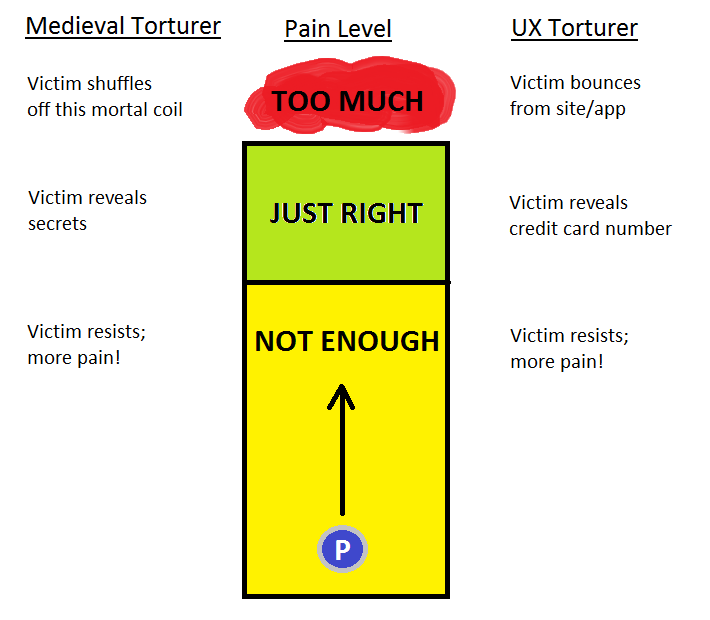 What is a UX Torturer? Companies need to convert users from the cheap (or free) tier into the premium tier so they can make more money. Building advanced features to upsell is too hard, and nobody wants more features anyway; they just want good UX on the basic features. Therefore, companies need people who can focus on crippling the UX of the cheaper tier. So that all sounds great in theory. Let’s take a look at some real world examples. Slate is an online news magazine, primarily ad-supported. Their site was a fairly standard layout with the article on the left, comments section below it, with a sidebar of ads. This overlay has a number of delicious usability problems. First of all, it only actually appears when it feels like it. Then, you have to choose where to rest your mouse cursor. If it’s on the overlay, it’s in the way of the comments you are trying to read. 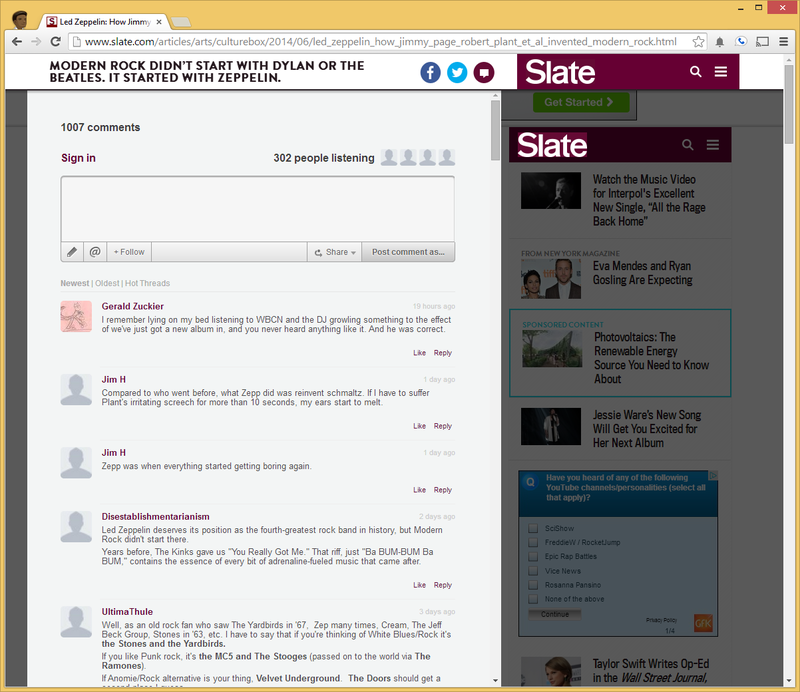 If it’s off the overlay, using your mouse wheel pointlessly scrolls the underlying page and not the comments. All in all, the new comments format was universally reviled. Sweet relief, if you will only but open your wallet! Excellent work by Slate’s UX Torturers. 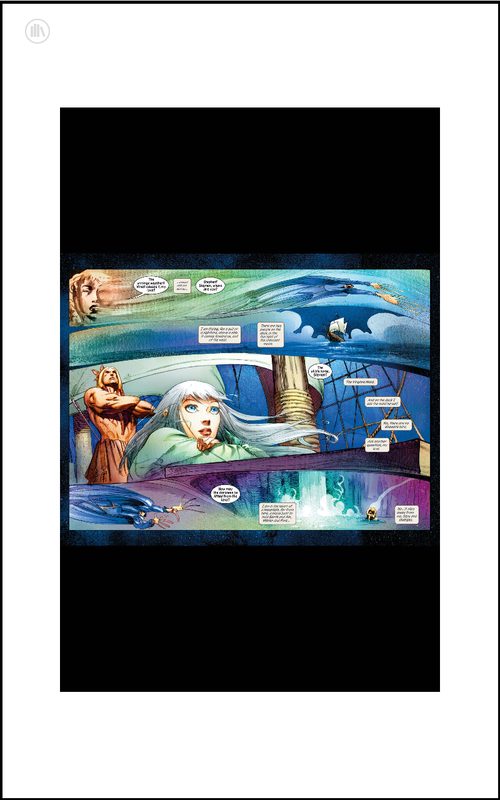 Amazon recently acquired ComiXology, a digital comic store, despite the fact Amazon already sells digital comics on amazon.com for lower prices. What could their strategy be? Overall, the UX was perfectly fine. Amazon’s UX Torturers were so effective that not only did he pay more for the same thing, he paid twice. Bravo, Amazon. Free-to-play gaming is the major leagues for UX Torturers. Many of these games introduce artificial wait times for tasks to complete, and then sell players power-ups to remove those artificial wait times. 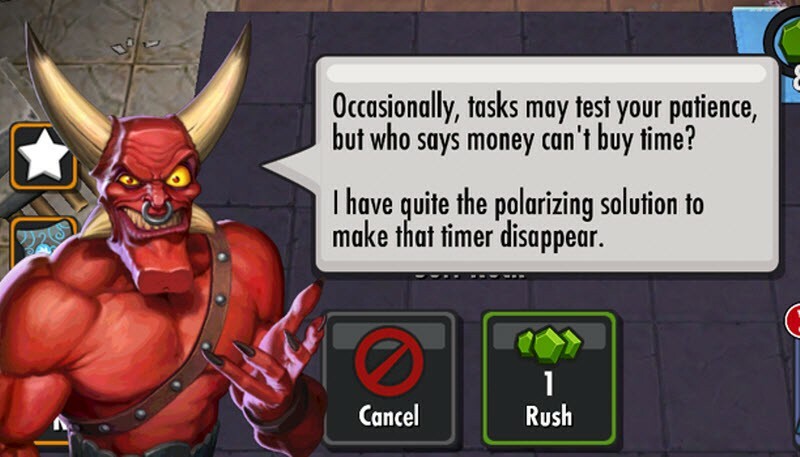 The above screenshot comes from Dungeon Keeper, a game with such excruciating wait times that British authorities recently declared it was misleading to even call it “free-to-play.” Regulatory interference aside, many of these titles have gone on to make enormous profits through the exquisite pain they inflict. No wonder that this industry employs many of the world’s leading UX Torturers. The puck (marked “P”) represents the level of pain you are inflicting. The goal is to get it into the green zone representing just the right amount of pain to monetize your users. If you fall short and remain in the yellow zone, you have not achieved your goal but you can at least try again. However, if you push too far and fall off into the red area, you will lose users permanently. The diagram also demonstrates how our predecessors, medieval torturers, faced the sames issues and how their outcomes map to ours. Just like for medieval torturers, experimentation is critical. What works in one scenario may not work in another. You may find your users can be quite resistant. However, do not get discouraged. Remember, you are the modern incarnation of a long and storied tradition. You are no mere UX Designer, faffing about with no measurable ROI. You are here to extract value from your victims. You are a professional. You are a UX Torturer!